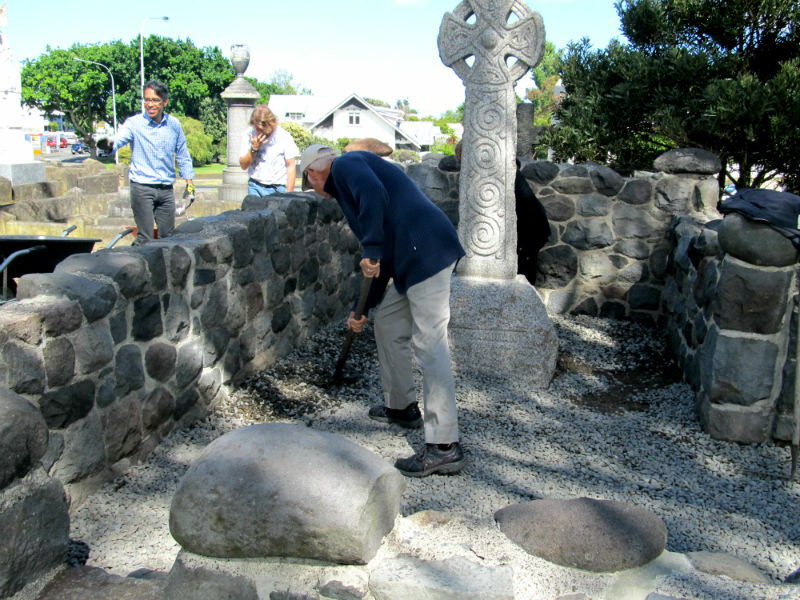 Working Bee: From left – Andres Salinas, Tom Turner and Ian McGowan from the Sarjeant Gallery Members’ Executive tidying up Henry Sarjeant’s grave in preparation for the re-dedication on 20 November. On a hill in the Old Whanganui Cemetery, corner of Guyton Street and Heads Road, stands the grave of one of the city’s most generous benefactors – Henry Sarjeant born 20 November 1829 in Gloucestershire, England. Mr Sarjeant immigrated to New Zealand in the late 1850s and when he died, 12 February 1912, aged 82 he left property valued at £30,000 in trust to the Wanganui Borough Council for the purpose of building and maintaining an art gallery and its collection. The building, perhaps the finest provincial gallery in New Zealand, is a testament to Mr. Sarjeant’s generosity, but his gravesite had been largely overlooked, until sculptor Hamish Horsley made a happenstance discovery. While looking for the graves of his great-grandparents earlier this year he was drawn to a finely carved cross, conspicuous among the other monuments. “I walked up to see it because it looked like an interesting Celtic cross made of granite – and there underneath it was Henry Sarjeant. It’s a huge, L-shaped enclosure, very neglected, and only he was in it. I was surprised so few people knew about it.” The Celtic cross is like a traditional cross but with a ring around the intersection of the stem and arms and is frequently decorated with ornate Gaelic patterns. Sarjeant gallery events/communication officer, Raewyne Johnson is thrilled with the restoration work. “You can see the new pointing quite clearly now but within about a year the surface will have weathered enough for it to match or blend in with the old pointing.” A rustic boulder wall with a small entrance surrounds the grave-site. Sarjeant Gallery executive members lent their muscle to barrow fresh gravel up the hill and onto the site. The members’ executive is also assisting towards the cost of the conservation work. The public is warmly invited to attend the rededication conducted by Kaumatua Uncle John Maihi and Archdeacon Stuart Goodin. 9.30am: Rededication of Henry Sarjeant’s grave-site. Whanganui Heads Road Cemetery, corner Guyton Street & Heads Road. This will be followed by morning tea at Sarjeant on the Quay. 3.30pm: Inaugural Henry Sarjeant Memorial Lecture by historian Jock Phillips at the Concert Chamber, Whanganui War Memorial Centre. All welcome. This story was first published in the Wanganui Chronicle on 15 November, 2016.